The most useful functionality of a chatbot is its ability to “chat” with people, making conversation the critical pillar in the relationship with the user. This conversation can either build the relationship or break the relationship. And this pertains to Real Estate agencies as well. The real estate industry is by nature a relationship-oriented industry. Agents, brokers, and clients form bonds over the most important and largest consumer transaction that takes place — purchasing or selling a home. And how can the chatbots help the realtors? Chatbots, when programmed with engaging conversation flow, can gather the prospect’s data while doling out the required information. Let’s say, you have a chatbot integrated with your company’s website and it comes alive when someone visits the website. It asks some questions about what they’re looking for. Intrigued, the user answers the questions. The chatbot can then assist the user with the buying or selling of properties. This way the chatbots make your business process efficient by helping segregate the potential leads from the lower-quality leads. As all the contact information belonging to the users remain stored on the cloud, agents can come back to these lower-quality leads whenever they have more time. Consider the same scenario with your company’s Facebook Messenger Chatbot. If someone is really looking forward to buy or sell property and if they come across your Facebook page, the chatbot can help you to gather their information so that you can contact them directly. For many prospects, the decision making process takes longer than ever as they are flooded with options. And chatbots can be a part of this process from the beginning to the end. At its core, real-estate business thrives on relationships and chatbots help deepen this bond. Chatbots automating first contact and providing 24*7 support, save time for the agents for the most important part of their job: closing the deal. And for all this to take place, your chatbot requires the right conversation architecture. ANA offers in-house conversation experts who will work with businesses to humanize the interaction and bring out the personalization of the brand in the conversation. 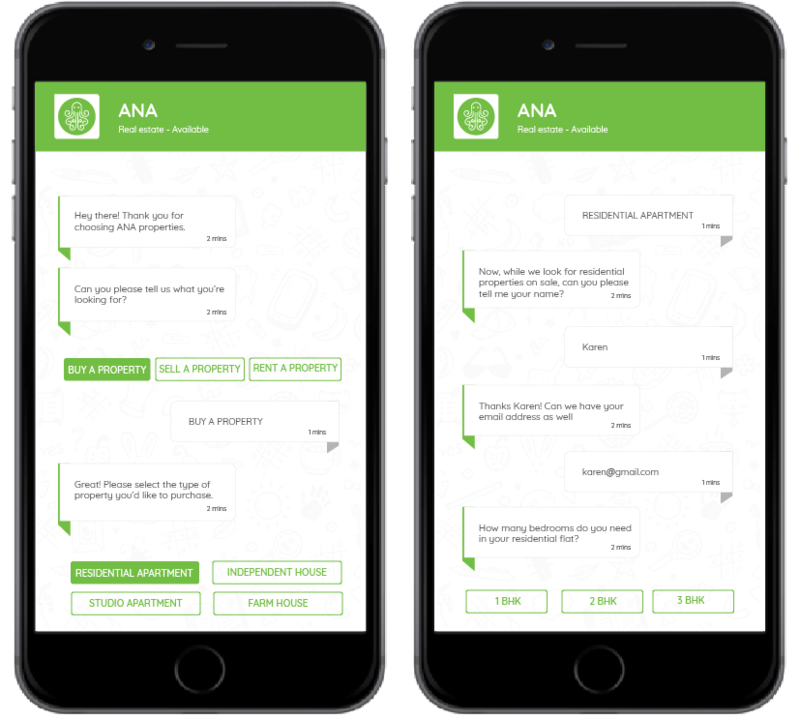 To create your own chatbot with ANA, an opensource chatbot framework, click here.